Cousin Deborah Davis, Judd, Jr.'s wife authorized and requested this message be posted on our Family Website. Please pray for Cousin Judd Jr., as his health is rapidly declining. He has been battling and suffering from brain tumor(s) for a while. Cousin Judd, Jr. is now in hospice in Sharp Memorial Hospital in San Diego. Your prayers are requested. Please do not visit nor call immediate family members. If anyone has questions, Cousin Deborah Davis asks that you call me, Bearnardean Broadous. I can be reached by telephone at 626.798.6132 or email broadousfamilybodchairman@gmail.com. Thank you so-o-o-o-o much for your prayers. The National Officers will be meeting on Monday, February 4, 2019. If you have an item you would like addressed, please forward it to me at broadousfamilynational@gmail.com. We are praising God for Cousin Shauna Williams who no longer has a trach, is breathing and eating on her own, and is talking strongly. Shauna has also been released as is resting comfortably at home. Shauna thanks everyone for your prayers. We are also praising God for Cousin Louise Williams who was released from the hospital a couple of weeks ago. She is doing well, enjoying her family, particularly her Grands. Louise sends her thanks for your prayers. Cousin Angela Hilson shares that she became a Grandmother on Friday, January 25, 2019. Her Daughter, Cousin Danisha, gave birth to a 3lb. 14oz. baby girl named Callie Kay. Danisha had an emergency C-Section. Danisha and little Callie are doing well says Cousin Angela. Congrats Danisha and Angela. Welcome to the family Cousin Calli Kay. Cousin LaNita Broadous sent word several months ago that her son, Cousin Miquail Broadous Jr. and his wife, Tasha, became the proud parents of a baby girl, Sevyn Shai, 6lbs 7 oz, on September 15, 2018. Congrats Junior, Tasha, and LaNita. Welcome to the family Cousin Sevyn. Cousin LaNita also notifies the family that Cecil Thompson was adopted into her family as a son by she and her husband Cousin Bishop Miquail Broadous Sr. several years ago. She invites the Broadous family to embrace Cecil, his wife Kisha, and their daughter Kennedy, as family. Welcome to the family Cousins Cecil, Kisha, and Kennedy. Family, thank you for joining us for Corporate Prayer on Sunday, January 13, 2019. The three family members that requested prayer or their families requested prayer for them, Cousins Louise Williams, Zelna Banks Windt, and Shauna Williams, are all doing better, and thank you for your prayers. Cousin LaNita Broadous, whose Mother (Mother Berry) is still in Hospice Care at home, thanks you for your prayers, and is asking that we continue to pray for her and her family during this time of transition. A special thank you to Cousins Gilbert Ross, Derwin Jackson, Myron Bradford, Deborah Broadous-Bradford, Patrick Sanders, George Merriweather, Mary Merriweather, and Kenneth Legrand Broadous, for leading our prayers. Each prayer was Powerful and filled with God’s Love. Again, thank you. Love you all, Cousin Deborah Broadous, National President. The 2019 Grandma Mattie Birthday Celebration Family Worship Service live stream is cancelled for 2019. However, on Sunday, January 13, 2019, in celebration of Grandma Mattie’s Birthday, we encourage families & groups of families to attend worship service together. Family corporate prayer may be held on that day as well. Information pertaining to the Corporate Prayer will be made available. Thank you, Deborah Broadous, National President. 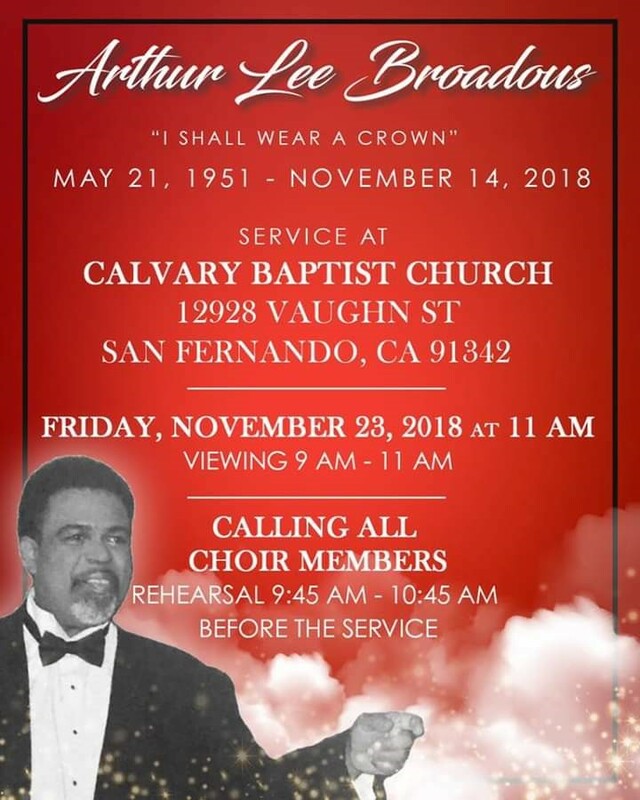 Dear Family, our Nephew/Cousin, Rev. Arthur Broadous, has passed away. He transition home to glory on Wednesday, November 14, 2018 at 7 p.m. Pacific Time. The family thanks you for your prayers, and ask that you continue to pray for them during this time. Family, please join me in extending our condolences to the Manus family in the passing of Cousin (Jodie) Damaris Williams, the brother of Cousins Ronnie Manus and Shauna Williams. My heart truly is saddened to hear of his passing. We had such great times together growing up. Our prayers are with you family. The Northwest Region will worship with Northeast Community Fellowship Church at 10:00 am on Sunday November 11, 2018. This will be the first of many services we will attend with our cousins Pastors George and Mary Merriweather. Let us all Come together for a “Broadous Good Time” in the name of the Lord. The Annual Christmas Dinner for the Northwest Region will be held on Christmas Day 2018 beginning promptly at 1:00 pm. The address is Alliance High School at Meek 4039 NE Alberta Ct., Portland, OR. We are asking that each family bring a dish. The meat will be provided. Please pass the word on to other family members. Cousin Deborah Broadous, National President. Please pray for Shauna Williams. She is in ICU battling pneumonia and COPD. Shauna is the Daughter of Marvis Williams, the Daughter of Jessie Broadous Manus. Delia is home after spending nearly a month in the hospital and rehabilitation. She is improving after what was thought to have been a stroke, but what turned out to be a severely pinched nerve that affected her left side. She is improving daily. She would like to thank everyone for the prayers and well wishes. Praise Report for Elder/Cousin Judson Davis, Sr.
Uncle/Cousin Elder Judson is doing fine; as you know he just celebrated his 93rd with a visit from Cousin/Elder Opal Lee. He is doing very well - still going to the church office a couple of days of week; his new slogan is "93 and it's all about me"
Delia has been released from the hospital and is now in a rehabilitation center. Her health has somewhat improved. Let us remember to keep Delia in our thoughts and prayers. Kevin Broadous and his wife Robei have reported to be doing well in among tropical storm Lane in Hawaii. The potential hurricane was downgraded from a hurricane to a tropical storm. They reported that there were heavy winds and rain. They were stocked up with all of the necessary supplies for the approaching storm. Let us keep Kevin and Robei in our prayers. Kevin is the son of Leon Jr., the son of Leon Sr. Continued prayer request & praise report for Elder/Cousin Judson Davis, Sr. Praise the Lord, Elder Cousin Judson Davis, Sr., is doing well. He was released from hospital on Wednesday August 15, 2018, and is raring to go back to his office at Greater Pentecostal Temple in Kansas City where he ministers to the Lord's flock. Oh yes, by the way, Elder Cousin Judson is still taking the stairs in his home - will be 93 years old on 9 September. PRAISE GOD! "Ninety-three, Oh taste and See" the Lord is good! BOD YOUTH COUNCIL MEETING scheduled for 18 August 2018 is rescheduled to 25 August 2018 at 2:30 p.m. Eastern Time. The Regional Officers meeting that was scheduled for August 18, 2018 has been cancelled. National President Deborah Broadous will contact each Regional President to Reschedule. Elder/Cousin Judson Davis, Son of Rebecca Broadous Davis had a stroke soon after they returned home from the Reunion. Ronnie Manus spoke with His Daughter, Rebecca, on August 3, 2018. She is asking for prayers for Her Father. Cousin Bernardean spoke with Cousins Judson and Mary Ann on August 4, 2018. PRAISE the LORD, NO paralysis anywhere and NO distorted speech. He is as alert as ever before; Elder/Cousin Judson is STRONG and of SOUND mind. Elder/Cousin Judson Davis, Sr. expects doctors to release him on Wednesday August 8, 2018. HALLELUJAH! As everyone knows, I recently had another stroke. I am doing well. Doing a lot of physical therapy, occupational therapy, speech therapy and seeing my neurologist. As I get older the parts start wearing out along with being hard headed makes them wear out faster. So I am telling all of you young people that if you are a (Broadus, Broadous) you are predisposed to Diabetes. Men get your check-up. We need to learn to love each other regardless. In my opinion when we were in our mother's womb, God put a spirit into that body/vessel or whatever you want to call it. That spirit was clean and pure. Unblemished by this Word or ourselves. No one knocked on their mother's tummy and said I want to have curly hair, I want to have straight hair, I want to have blue eyes, I want to have brown/green eyes I want to be tall, or I want to be short. I want dark skin, or I want light skin. I want to be born into a rich family. We had nothing to say about how we came here, yet we blame each other for those very things that we had no control over. I say all of this to say, once you get here, you can treat people right, or you can be a fool. Laying in your crib in the Hospital when you were born. the ugliest person could have walked up to your crib and you would have started smiling, laughing and giggling and showing love because that is the type of spirit that was put into that vessel. Have you ever seen a baby with an AK-47? I will not go on but one of our jobs is to give that spirit back to the LORD in as close as a perfect condition like it was when you received it. Yes the body will go back to the dust from which it came and the spirit (provided it is cleaned up) will go back to the spirit from which it came. You get the idea. This potluck will bring us together as we play games, delight in each other's cooking, enjoy family time, and get reacquainted. If you have questions or concerns, please contact Wanda Lois (event coordinator) directly. "When God stretches you, don't be afraid. Prepare. Take a deep breath. Take a step forward, and enjoy the blessings". The Board of Directors approved a plan for the Broadous Family Historian for each region headed by National Vice President Kenneth Broadous. With the re-launch of the Broadous Family Website, our family has the potential to come together and share valuable information with one another 365 days a year. Our first meeting was February 24, 2018. Please see calendar. Bernard Ward (Cousin Jeffrey Duncan's wife, Patricia Ward-Duncan's oldest) son passed away on March 28, 2018. Bernard had been very ill the past few weeks, and the family removed him from life support. South Bay Junior Academy in Torrance, CA was honored to be the recipients of the City of Torrance Green Award when we created our sustainable garden in December, 2015. We were awarded the Be Water Wise grant, Orchard Supply Hardware Community grant and the Health Ade grant through the Whole Foods Foundation. South Bay Junior Academy, along with the help of our friends and experts, Mike Garcia, owner of EnviroscapeLA and Brandy Williams, owner of Garden Butterfly LA are helping to create and revolutionize the sustainability movement in the greater South Bay area and could not be happier to bring this aesthetically pleasing and scientific center to our students, school, and community. Join us Friday, February 23rd at 9:30 AM at 4400 Del Amo Blvd. in Torrance, CA for the dedication of our aquaponic system, and meet with experts Mike Garcia and Brandy Williams. The Board of Directors approved a plan for the Broadous Family Historian for each region headed by National Vice President Kenneth Broadous. With the re-launch of the Broadous Family Website, our family has the potential to come together and share valuable information with one another 365 days a year. Our first meeting is February 24, 2018. Please see calendar. On behalf of the West Region, Region Pres. Cousin Jeffrey Duncan thanks everyone for your prayers during the December 2017 California wild fires. He says everyone is well- Thank you.